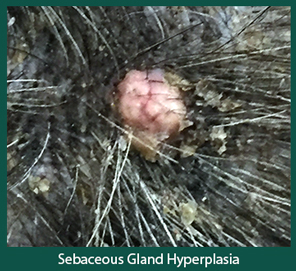 Sebaceous Gland Hyperplasia is a non-cancerous skin tumor that can develop anywhere on the skin. It is an overgrowth of sebaceous gland cells that are associated with hair follicles located in the skin. What can cause Sebaceous Gland Hyperplasia tumors? What do these tumors look like? 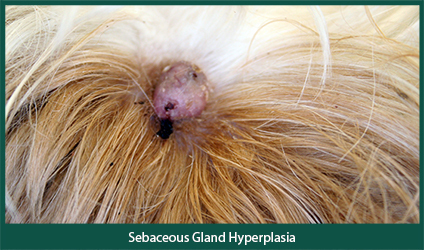 A Sebaceous Gland Hyperplasia tumor is usually raised, wart-like or cauliflower-like in appearance. A single tumor or multiple tumors can be present on an affected animal. They can be pink to orange in color and range in size from 0.5cm to 1cm in diameter. The tumors occur most commonly on the head, limbs, trunk, and/or eyelids. They can be located anywhere on the body where hair follicles are present. This tumor typically does not cause irritation to the affected animal. This type of tumor is common in dogs and uncommon in cats. It can occur in any breed of dog, but are most often reported in beagles, cocker spaniels, poodles, dachshunds, and miniature schnauzers. In cats, Persians seem to be predisposed. The age of diagnosis often ranges from 9 to 10 years of age; however, affected individuals can be younger or older. The tumors are often diagnosed during a dermatologic physical examination. Cytology from a fine needle aspirate, reveals clusters of glandular cells. However, if the tumor is lacerated (from scratching or other trauma) and/or bleeding then sometimes a biopsy is needed for a definitive diagnosis. Monitor long term or surgical removal is recommended. When removed surgically they rarely recur; however, development of additional new nodules is not uncommon. **Caution: All nodules should be examined and monitored by a veterinarian.